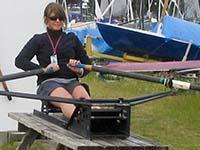 Club Rowing Lessons are open to all Club Locarno Rowing Fleet Members. Introductory Learn to Row Lessons are open to the PUBLIC as well. Check out the Rowing Calendar for more details. Note: You must be able to swim, and have adequate fitness, strength and flexibility. When you have mastered the basics, consider upgrading your skills with advanced lessons. The level 2 lessons consist of 4 – 2 hour lessons wherein participants will be introduced to all the other boats in the fleet, rough water rowing techniques, distance rowing, advanced technique and rowing starts. Shorter 2 hour clinics that focus on specific parts of the stroke. Rhythm -- What is rhythm, and how does it change with speed? Boat moving -- Related to the above focuses, but an independent idea. Private lesson are available to Club Locarno members only. You can purchase a two hour or four hour block of lessons, and schedule your times directly with the instructor. To inquire about Private Lessons, contact the Rowing Director. If you have previous rowing (sculling) experience, all that you need is a checkout clinic when you join the fleet. We will assess your skills, and introduce you to the fleet and to the club policies and practices. Checkout clinics are free for members - just sign up in advance. There are also good Refresher clinics for those who haven't been on the water for a while.